Meryl Streep does a very good imitation of Julia Child. But the real Julia Child is even better. While forced to stay home from work due to yet another round of the snowcalype, I busied myself trawling the intertubes. Posted on andrewsullivan.com was this YouTube clip of her as a guest on Letterman sometime in 1987. Rugelach (pronounced RUH-ge-lakh) are rolled, crescent-shaped mini pastry-style cookies. They can be filled with fruit preserves, chocolate or both if desired. Rugelach are made with using cream-cheese dough. I have made them with yeast doughs and cookie doughs, and in my humble opinion the very best kind are ... whichever one I happen to be eating. But the cookie style is a little easier to make. I haven't tried yet, but you can probably use margarine, parve cream cheese substitute and soy milk if you want to make this parve/vegan. Tabouli is a middle eastern dish. It can be a light entree, or a side to anything else: meat, dairy or another parve dish. Kasha is also known as bulgar or buckwheat groats, which sounds crunchy, and it is if not cooked. It comes in several grinds, from fine to coarse. I prefer the medium, but you can use your favorite. Many kasha recipes start out by first pan-frying the kasha mixed with a lightly scrambled egg, but that step is not used here. Fresh tomatoes and parsley are required though, so if it's the dead of winter where you are and good, ripe tomatoes are not available, you might want to hold off making tabouli until a later time. Serves 8 as a side-dish, 4 as a main dish. 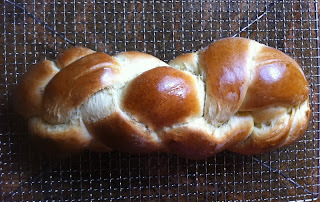 Challah is a honey-egg bread, shaped into a 3 or 4 strand (or more to be really fancy) braid. Except on Rosh Hashanah, where the dough is coiled into a round shape to represent the life cycle. A good challah does not need any butter, jam or anything else on it. In fact, storage instructions are not included because there are rarely any leftovers to store. The original recipe, given to me years ago by a fellow Hadassah member, only makes 1 loaf because I usually make it in my stand mixer with the dough hook, but the bowl can only hold up to 5 cups of flour (after that the dough climbs up the dough hook in a futile attempt to escape). When I first bought this particular stand mixer, I had previously burned out 2 others of lesser quality, and didn't want to have to replace a third one. My current mixer is now over 17 years old and shows no sign of pooping out. When I win the lottery, I'll buy the larger version. Since Purim is coming up, I thought a recipe for Hamantaschen would be nice. Depending upon which authority you listen to, Hamantaschen represent either Haman's ears or Haman's hat. They used to be only made with prune filling, but nowadays they can be filled with preserves, nuts or even chocolate. Despite my love affair with the latter, I really prefer a nice raspberry preserve filling. One day my middle child was home from school sick. I don't recall what disease he had, but it was the kind where they don't really have that bad of a fever, but they feel miserable and don't want to eat much. That was the day I decided that I would try making this new recipe I found for Dal. I offered it to middle child, who at the time lived on air alone, but for some reason said he would try it. He loved it! So from then on whenever he was sick he would ask me to make some for him. Dal is an Indian dish usually made with lentils. Red lentils are really misnamed because they are orange-colored dried in the bag, and cook up yellow. Red lentils do not have the earthy taste of regular brown ones, so if you don't like brown try red.